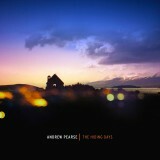 OX-4-SOUND productions proudly present the debut album 'The Hiding Days' by Andrew Pearse. Go to www.andrewpearse.com for more info and to buy the physical CD release (paypal link) or hit the link below for itunes. Enjoy.